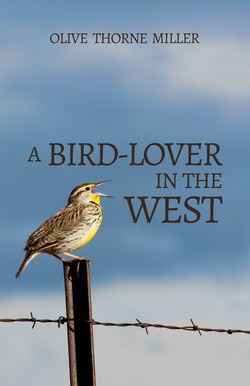 A Bird-Lover in the West by Olive Thorne Miller chronicles the natural history of the birds (among other flora and fauna) in Ohio, Colorado, and Utah. 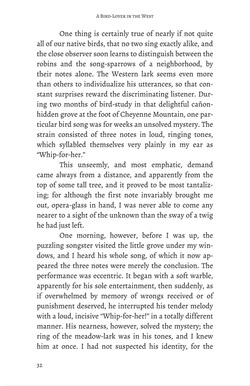 When Miller finds herself in nature, she inevitably turns her attention to the birds, and her astute direct observations of their behavior are simultaneously scientific and inspirational. 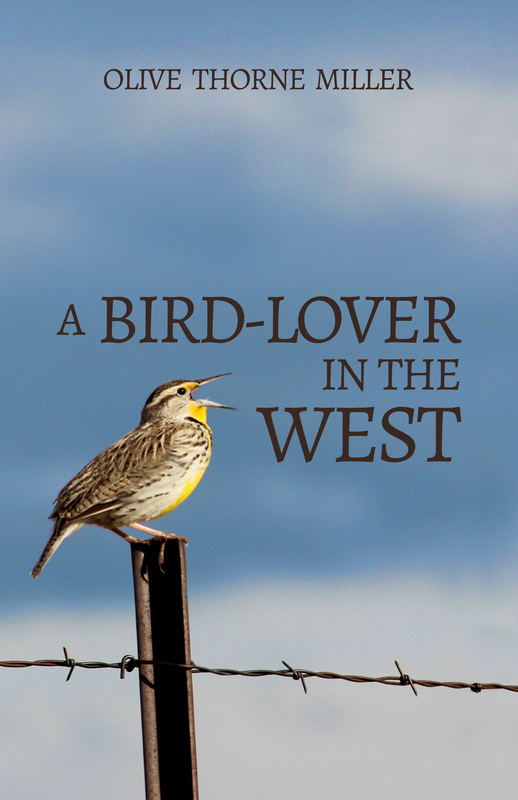 Readers will be itching to get outside and seek some feathered friends for themselves. 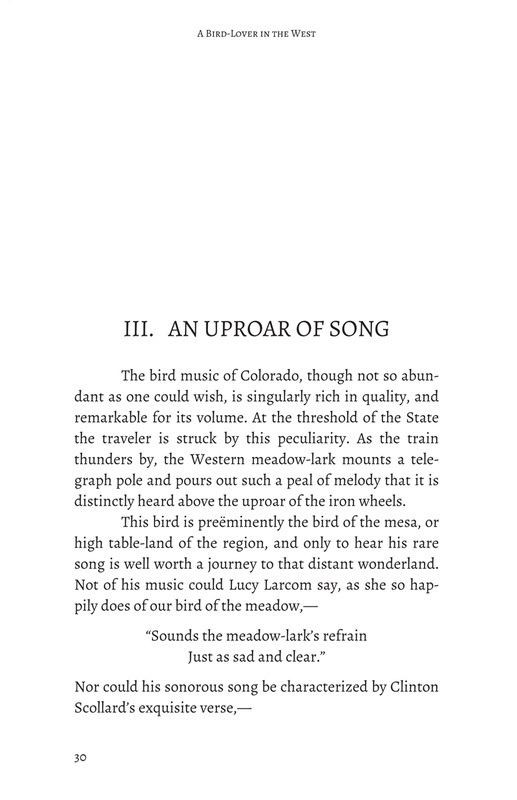 "If we cannot journey to Cheyenne Mountain, there are new worlds to be discovered about us, and this book shows such loving study of bird life that some may be tempted to begin it at home. 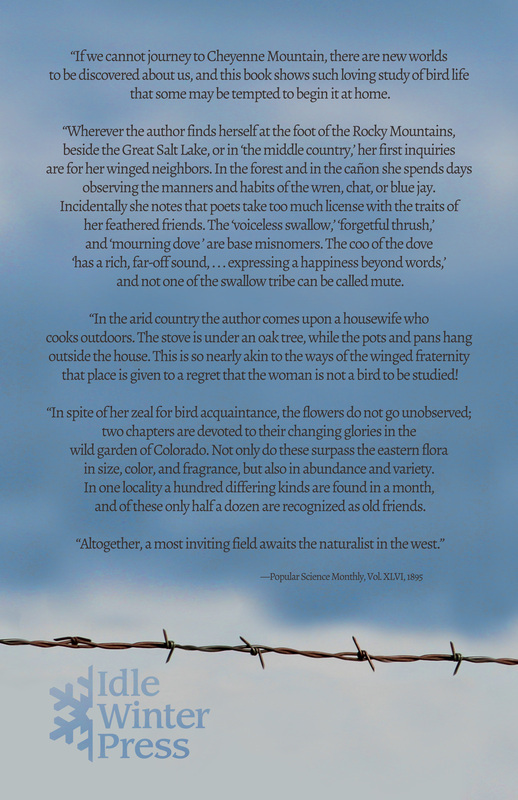 "Whenever the author finds herself at the foot of the Rocky Mountains beside the Great Salt Lake, or in 'the middle country,' her first inquiries are for her winged neighbors. 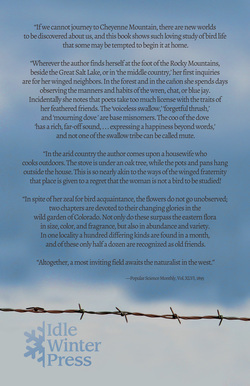 In the forest and in the cañon she spends days observing the manners and habits of the wren, chat, or blue jay. 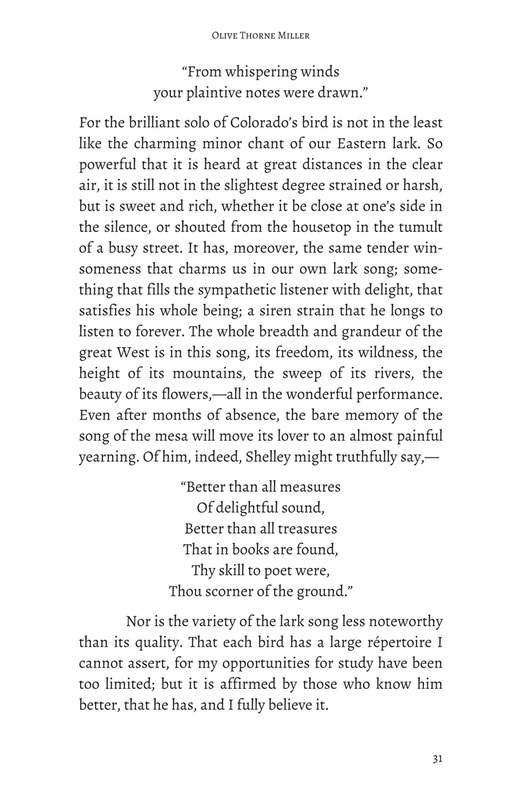 Incidentally she notes that poets take too much license with the traits of her feathered friends. 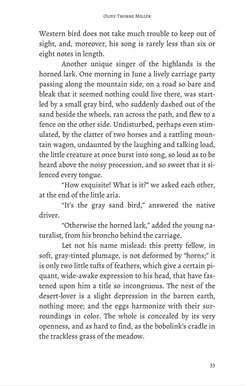 'The voiceless swallow,' 'forgetful thrush,' and 'mourning dove,' are base misnomers. 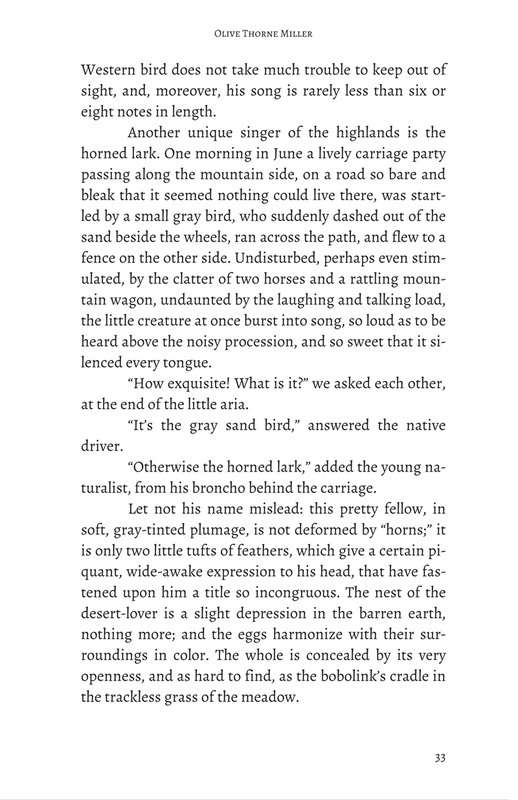 The coo of the dove 'has a rich, far-off sound, ... expressing a happiness beyond words,' and not one of the swallow tribe can be called mute. "In the arid country the author comes upon a housewife who cooks outdoors. The stove is under an oak tree, while the pots and pans hang outside the house. 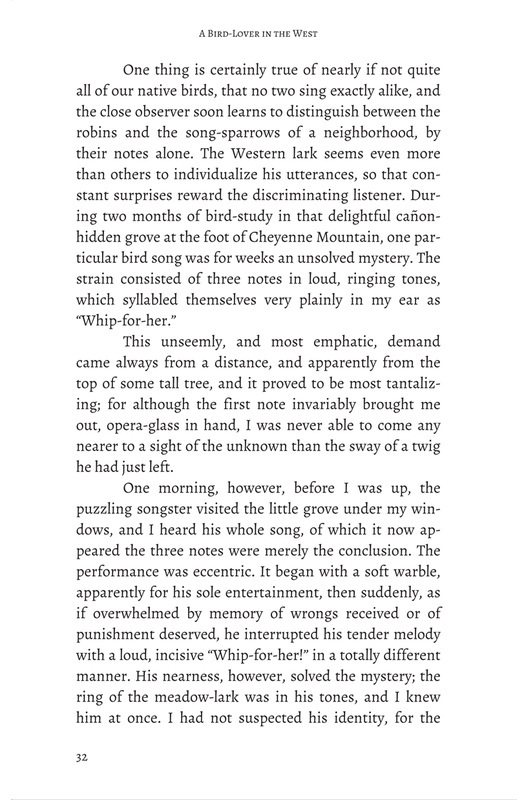 This is so nearly akin to the ways of the winged fraternity that place is given to a regret that the woman is not a bird to be studied! 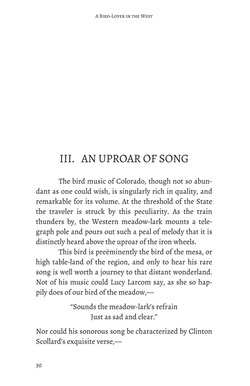 "In spite of her zeal for bird acquaintance, the flowers do not go unobserved; two chapters are devoted to their changing glories in the wild garden of Colorado. Not only do these surpass the eastern flora in size, color, and fragrance, but also in abundance and variety. In one locality, a hundred differing kinds are found in a month, and of these only half a dozen are recognized as old friends. 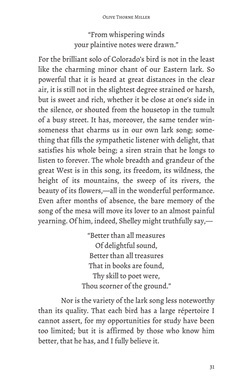 "Altogether, a most inviting field awaits the naturalist in the west."